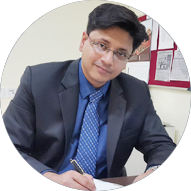 Laparoscopic GI Onco Surgeon in Kolkata. 1. When my Father developed Gastro Intestinal disease,we had no better option than to visit Dr. Suddhasattwa Sen of whom we heard from our close friend. After surgical reconstruction he is now leading a life like any other normal man.We are grateful Doctor. 2. Thank God we took our Father-in-Law to Dr Sen two years back.He was suffering from acute Hernia symptoms.Under Dr Sen’s able guidance and subsequent treatment my Father is keeping fine. Me and my family are extremely grateful to him. 3. While I was in Kolkata, on vacation, my sister was under Dr. Sen's urgent care. My experience was excellent and Dr. Sen was attentive and took care of my Sister’s immediate problem. In my opinion, she was given the best care available in Kolkata. I returned to the States without any issues and as per his advice, all the necessary medical procedures have been successfully completed. I recommend all of my friends and family in the US and Kolkata to contact Dr. Suddhasattwa Sen for any surgery related issues. All the best to you. Thank you so much for everything! 4. Dr. Sen recently treated my son. Dr. Sen has an invaluable (but rare) quality in a physician - patience. He does not talk "down" to his patients. He treats them as intelligent individuals - not as a bed number or a unit in an assembly line operation. His mode of communication inspires immense confidence - and therein lies half the cure. Thank you Dr. Sen.
5. We both are childhood friends residing in the same locality & studied in the same school. Now Dr Sen has made himself a renowned GI Surgeon from Kolkata. Always feel proud of him & privileged to be Doctor’s childhood friend. Suddhasattwa, keep doing good work which will make U HAPPY. All Good Wishes to YOU. 6. Dr. Suddhasattwa Sen is one person with whom I have cherished to just talk with. A person gets 80% cured if he meets a genuinely good person. We have developed a mutual respect for each other which also helps to keep a longstanding patient-doc relationship going. All the best Sir, keep the morale high with everybody you meet in life. Thanks. I still remember the day when I was admitted in Medica Superspecialty Hospital, Mukundapur, Kolkata in the late summer of 2016 with an unknown illness. It was one of the toughest times of my life. He knew how difficult my struggle with the illness was and how terrified I was after the initial diagnosis came out as Crohn's disease that involves remaining on medications for life. The wrong diagnosis could have resulted in a calamitous consequence. But as a doctor special, he went way above and beyond everything, I ever could expect. He conducted second round of diagnosis, which confirmed that I was suffering from Transverse Colon Cancer and not Crohn's disease. Although both the disease were not to from Transverse Colon Cancer and not Crohn's disease. Although both the disease were not to my liking but simply getting to know the right disease was a bit of welcome relief as one would not succumb owing to wrong diagnosis and treatment. The world would be a much better place if all of the doctors conducted additional reviews like Dr. Sen did to ascertain the actual cause rather than jumping into conclusion at the first find. In the post diagnosis days, we were at our most despondent and throughout these challenging times, he was there to encourage us. His belief in the course of treatment and its end result never failed, and he infected us with his positivity. Before highlighting him as a doctor extraordinaire, I want to underscore that he is an extraordinary human being. Not many people have a chance to say that they know as great of a doctor as I do. To me, he is a magician, a great physician, a special gift from God. Medicines can cure, but a good doctor's inspirational words can give the strength to fight from within. And it is from his words of fight from within. And it is from his words of inspiration that my feeble body drew the much needed strength to fight cancer that in turn helped me in deciding to fight to survive, which needed to come from within. Dr. Sen has given me a new lease of life. His talent and caring manner is a giant leap to the medical profession. He truly is a lifesaver. It is said that "An apple a day keeps a doctor away". But who wants to keep good doctors like him at bay? I would instead choose to keep the metaphoric maxim away. Any doctor can prescribe, but only a few good ones can really heal. He is the latter. Getting to know a doctor like him is something that nearly everyone wishes, but not many people are fortunate to experience. Thank you Dr. Sen for being so much more than I ever could have thought I could find in a doctor. He is an amazing person and it has made such a huge difference in my life and I will remain forever grateful to him. It is the little things that matter to most people and he has done so many little things for me and he has done so many little things for me that make me know how much he cares about his patients. I always thought that surgeons were haughty, arrogant and self-obsessed. Thanks for proving that they are the exact opposites. Surgeons like him are not just doctors, but real lifesavers. I may not have talked to God in my prayers, but in his professional expertise, I have seen some of God's blessings and favours. I would like to thank Dr. Sen for the excellent work while performing surgery on me. I must admit that his hands were skilled as my incision was very small and during the recovery period the pain had been minimal. I had been recommending him to everyone that I came across who suffers from GI conditions. Because God could not be everywhere he made sure that we have doctors like him who have the gift of healing mankind. His bright aura brings so much joy and inner healing. A patient's testimonial is less of recognition of a doctor's expertise, and more of a doctor's ability to listen, care and heal. I can vouch for ability to listen, care and heal. I can vouch for the fact that his abilities are unmatched. If it were not for the medical marvels that he orchestrated during the removal of my cancerous transverse colon, I wouldn't be alive and writing this post today. Please accept my sincerest thanks and accord all the credit to Dr. Suddhasattva Sen, the GI & OT teams and unforgettably all those unsung heroes at the Medica Superspecialty Hospital, Kolkata.